Many factors go into getting the best sound from your bass drum: Its size and quality matter, as do your bass drum pedal and your technique. Add a good kick drum mic to the equation, and you’re well on your way to producing a sound that’s just right. While we can’t help you with tuning and other factors, we’ve researched some of the best kick drum mics on the market, plus we’ve curated some tips for choosing the one that’s right for you. You might already know that bass drums sound best when amplified via cardioid (directional) microphones designed to minimize the risk of bleedover from other sound sources. Here are a few more things to keep in mind. Kick drum specific –No surprise here – the best kick drum mics are purpose-built to amplify bass drums. It’s true that you can get passable results with other setups however that can take quite a bit of finagling. Ease or difficulty of positioning–There’s plenty of action near your feet when you’re drumming, and it can be frustrating to position certain mics inside your bass, particularly when they’re mounted on stands and you’d rather not have them positioned toward the front of your kit. The good news is that many manufacturers have taken positioning into consideration when creating new designs. The best kick drum mics are easy to set up, and they’re just as easy to adjust so you can get the sound you want. With these and a few other factors in mind, we’ve assembled this list of 5 great kick drum mics worth considering. 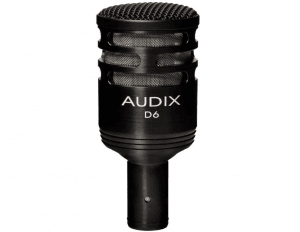 The Audix D6 Cardioid Dynamic Microphone offers a durable housing. Ideal for use with kick drums, bass cabinets, and floor toms, it offers the ability to handle extremely high SPLs (over 144 decibels) without any distortion. This microphone provides crystal clear sound at low frequencies. The cardioid pickup pattern provides sound isolation and reliable feedback control. With an aluminum body, a black anodized finish, and a tension-fit heavy duty clip, it offers a sleek, transformer-free design. Drummers and bands who are interested in getting a rich sound that really resonates without a lot of finagling. While it’s definitely a step up in price compared to some other options, this versatile mic delivers a steady, quality performance in a variety of settings. 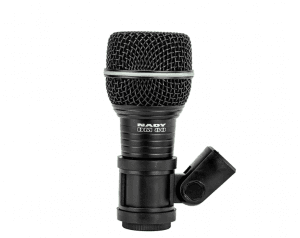 The Nady DM-80 drum microphone features a cardioid polar pattern and a neodymium element. The die-cast body is fitted with a hardened steel grill and an internal shock mount for durability. Gold-plated XLR provides excellent conductivity. Bands and drummers who want a decent kick drum mic that meets tight budgetary constraints.Nady is a well-known brand with a good reputation, and despite the low price, this mic gets mostly favorable reviews, mainly from users who are thrilled that it sounds pretty good despite the fact that it’s a fraction of the cost of some other options. While this mic isn’t likely to please thosewho play in the most demanding settings, it’s a great starter mic. The Sennheiser e602 II Evolution Series Dynamic Bass drum microphone features an integrated stand mount and a large diaphragm capsule for excellent bass response. This unit is versatile enough for use with bass drums, bass guitars and low brass, along with other bass instruments. It is equipped with an XLR-3 connector. A 10-year warranty is included with all Sennheiser microphones. Drummers who want a punchy rock sound that can be “felt” via the subwoofers at live shows. The Sennheiser e602 II Evolution dynamic bass drum microphone offers quick, easy setup. 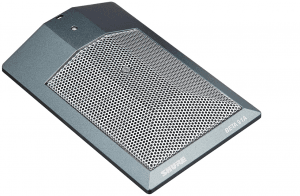 It’s ideal for a variety of genres, but really shines in rock and metal applications. 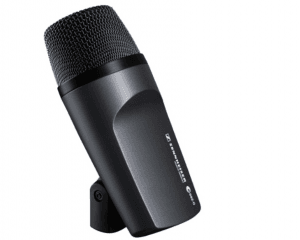 This mic is a great one for active bands. While it’s not the cheapest on our list, it delivers reliable, versatile performance while offering a price that’s a touch lower than some of its competitors. The Shure BETA 52A supercardioid dynamic kick drum microphone is designed to deliver studio-quality sound, even at high SPL. The supercardioid pattern rejects peripheral noises and provides high gain before feedback. A built-in adjustable locking stand adapter lets users set this mic up inside a kick drum or place it on a stand. An integral XLR connector makes setup simple, while the hardened steel mesh grille provides protection from impact. A neodymium magnet assures high signal-to-noise ratio output. Drummers and bands who perform live, and who are ready to step up from a cheap kick drum mic. While it’s not the most expensive microphone we found, the Shure BETA 52A makes its way onto numerous “best kick drum mic” lists. It’s popular with players who specialize in a variety of genres. Whether you play jazz, rock, country, or bluegrass, you’re likely appreciate this mic’s ability to make your bass sound naturally appealing. 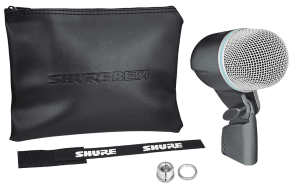 The Shure BETA 91A half cardioid condenser kick drum mic features an integrated preamplifier. The low-profile design is easy to slip inside a bass drum, minimizing the amount of equipment around the drum kit and simultaneously eliminating unwanted noise. A two-position contour switch lets users choose between low-mid scoop and flat response settings.This mic comes with a zipper storage bag. No external mounting accessories are required. Bands and drummers who long for the best sound possible. While this mic represents a small investment, the payoffs are big in terms of sound quality, whether you’re live or recording. The body design is ultra-convenient; not only does it cut down on the amount of equipment on stage, it makes for faster setup and teardown. There are many factors that go into selecting the ideal microphone for your bass drum. Here are just a few to keep in mind as you consider your options. Technical aspects:Many microphones look similar, but their capabilities differ. Mics that aren’t specifically designed for kick drums tend to fail, simply because they can’t handle the unique sound profile. For example, most instrumental mics are short on frequency response, and they aren’t designed to provide tonal accuracy at the low end of the bass pitch spectrum. Sound Pressure Level:Most vocal and instrumental mics can’t handle the loud sounds produced by a kick drum (well over 120 decibels in many cases) and this leads to distortion. Kick drum mics are built to provide accuracy even at high decibel levels. Price:In many cases, the more you spend, the better off you are. We’ve got great news for you: Unless you’re setting up a kit for recording and you need the very best kick drum mic on the market, you can easily get a great sound with a mid-range model. Keep in mind that you still get what you pay for in most cases; cheap mics tend to have shorter life spans and more pain points than their pricier cousins. Compromise is the word of the day here. With some thoughtful sound engineering, a good-quality drum kit, and a reliable kick drum mic like the popular models we’ve reviewed here, you’ll find that you get a great sound from your bass, minus the distortion that can occur with a sub-par mic.